It’s tough getting old, and that goes as much for giant pandas as people. 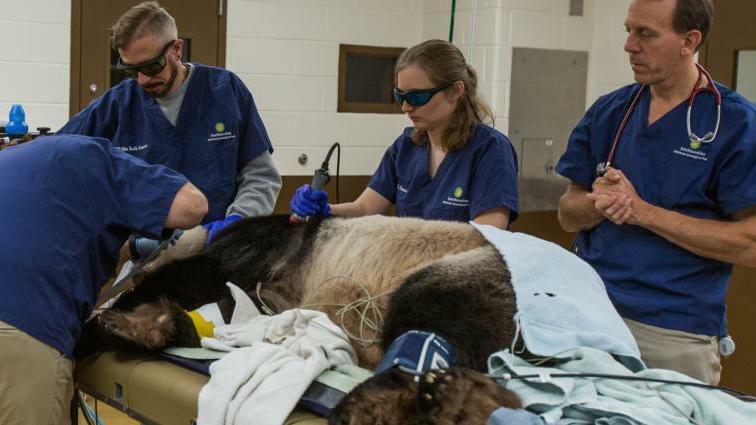 Veterinarians at the National Zoo in Washington, D.C., say Tian Tian, an adult male panda, received laser treatment and acupuncture for what they initially thought was a touch of arthritis in his left shoulder. During the exam earlier this week while the 20-year-old Tian Tian (pronounced t-YEN t-YEN) was under anesthesia, vets also took blood and urine samples and performed x-rays. Chief Veterinarian Don Neiffer told CBS that he used to think acupuncture was “all a bunch of hooey,” but not anymore, because he’s seen it work. Neiffer tells CBS news that after Tuesday’s exam Tian Tian’s shoulder soreness was determined not to be not the result of arthritis after all. As for the weight loss, however, they have yet to diagnose a cause. The panda was born in China and is the half-brother of Bai Yun, who lives in San Diego — at the zoo there, that is. Tian Tian is the father of two cubs through artificial insemination. One of them, Bei Bei, was born in 2015 and also lives at the National Zoo, although he is scheduled to return to China in 2019, at the age of 4.